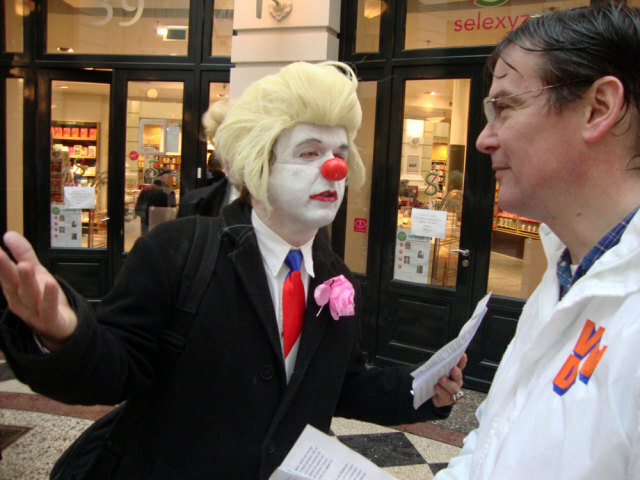 CDAPVVD Clownpaign Tour: The Blond Parties want your vote! The Blond Parties want your vote! Febr. 26th 2011 - Next week (We. March 2nd) elections in the Netherlands: the provences and indirectly the senate. Unsure if the right-wing populist government will get a majority. So it's about time to give them some help! 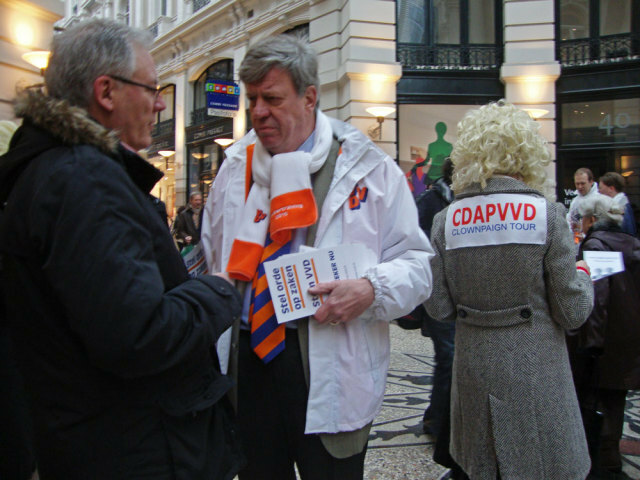 Rebel clowns started a promotion campaign for the CDAPVVD, the 3 in 1 party responsible for loads of measures coming our way. The Hague was the place to be! Saturday, Febr. 26th: it should be the most exciting campaign day before the elections: it wasn't... 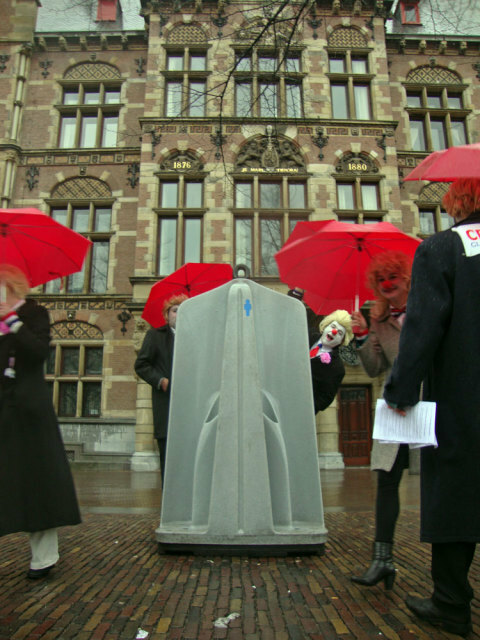 It was raining and we were in the Hague. 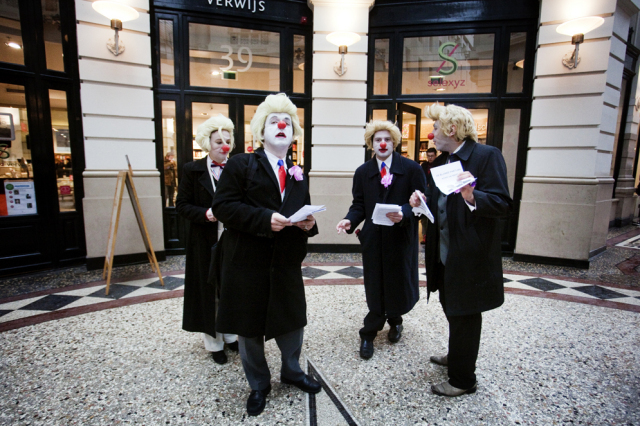 We started 11.00 o'clock our clownpaign tour in the Vlamingstraat and Spuistraat: a boring shopping area. There we met our first colleagues from the Christendemocrats CDA, had a nice chat with them and went further in the direction of the Hofvijverweg - because we had 1 big desire: meeting our dearest friends of the rightwing liberal party VVD and especially Ivo! Ivo who? Ivo Opstelten, the minister of Security and Justice! Wowww; he's a hell of a campaigner! It was raining and VVD and clowns have 1 very important thing in common: they don't like rain!! So we spent hours together in the indoor shopping streets the Passage. And that was fun! Ivo wasn't alone; he had company of several other VVD-campaigners. They had their flyers. We had our flyers. For sure we spread more flyers than them! Competition is a clown liberal principle! 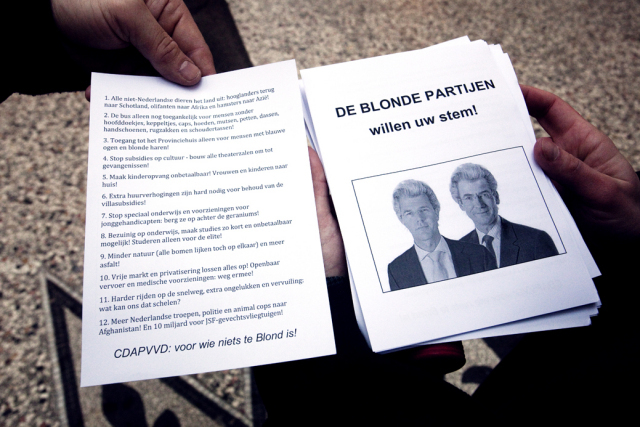 We had a great flyer with a fantastic heading "The Blond Parties want your vote" with a picture of prime-minister Rutte (VVD) and minister Verhagen (CDA). Both with a Wilders (PVV) wig. "All non-Dutch animals should leave the country: the Highland cattle back to Scotland, elephants to Africa and hamsters to Asia!" "Less nature (all trees look the same) and more asphalt!" "No money, no masters degree: let the elite be educated!" "More Dutch troops, police and animal cops to Afghanistan! And 10 billion for JSF-fighters!" To be honest: our beloved friend Ivo didn't do much. He talked very, very long with people he already knew and several times he enjoyed the terrace seats. In the meantime we continued leafleting and tried to convince people how wonderfoool the blond parties are doing their thing. Not everyone agreed. Some people made statements they don't want to be in touch at all with Wilders and the other blond parties. And there were also some PVV-fans who thought we were making fun of Wilders and showed their middle finger. 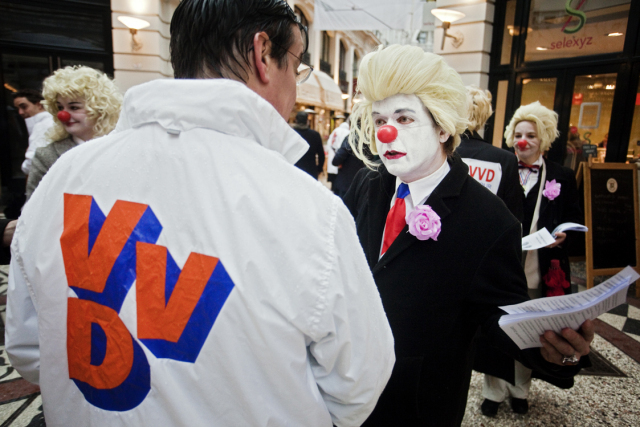 One of our clowns was pushed by a PVV-fan. But loads of people accepted the flyers with a smile. Some of them even asked for more to spread at home! 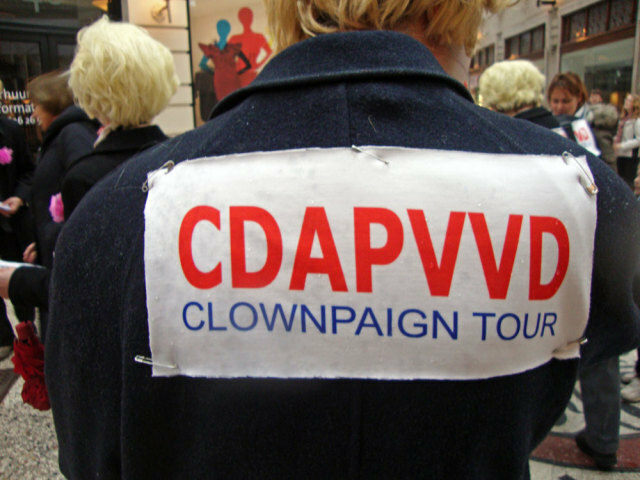 What else could you wish during a CDAPVVD clownpaign tour?! Finally we accepted the rain should take hours and left the indoor area. Walked around the Binnenhof, city hall and other shopping streets. Had contact with campaigners from other parties, but most of all with many very nice people from the Hague. After more than 4 hrs of clownpaigning all our flyers were gone. Time for a break, time for a beer!